Precisely crafted organs that should be a perfect fit physically (as well as not triggering an immune response) may be closer to reality. A biodegradable resin has been created that can be manufactured to precise tolerances using stereolithography (a three-dimensional printing technique). For the first time, researchers from the University of Twente have developed a biodegradable resin that can be used for this replicating machine. They have made the resin in such a way that it can be broken down by the body. Making objects from this resin may have great advantages for a many medical applications. If, for example, a child has a heart valve disorder, a 3D digital image of the heart valve can be created using a CT scanner. The model in the stereolithograph can be copied exactly with the new resin. If the structure is made porous, the child’s own cells can be placed on it. This porosity also gives nutrients access to the cells. Ultimately, after the carrier structure has broken down, only the natural tissue remains. Biodegradable carrier structure made using stereolithography. 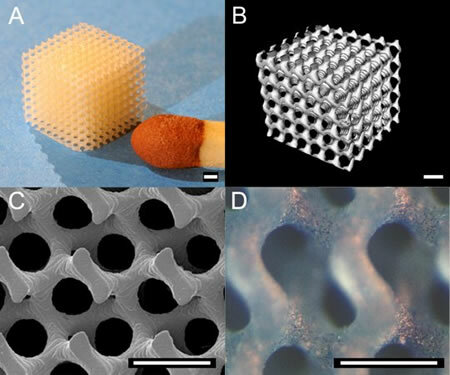 a porous structure fabricated using stereolithography. image. D) Porous structure sown with bone cells. Some of us older science fiction fans are watching this technology very closely, because we're starting to need those artificial organs we've been reading about since our childhoods.